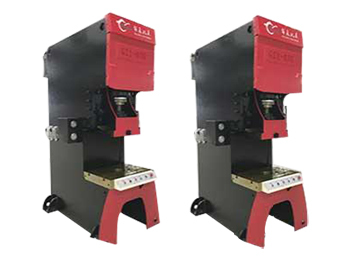 The pneumatic punch press machine features 3 performance options: point motion, continuous and single. The machine utilizes a computer aided optimization design, using PROE and Solidworks software, and carries a variety of simulation load tests, destructive tests, force analysis tests and more. 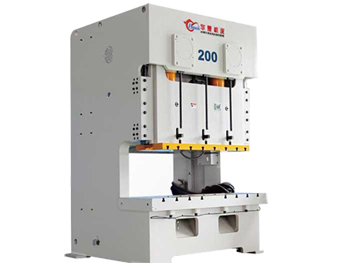 The machine features a streamlined shape, with a compact structure and small occupation area. This equipment is a full steel welding machine, with an optimum CAD design program used. 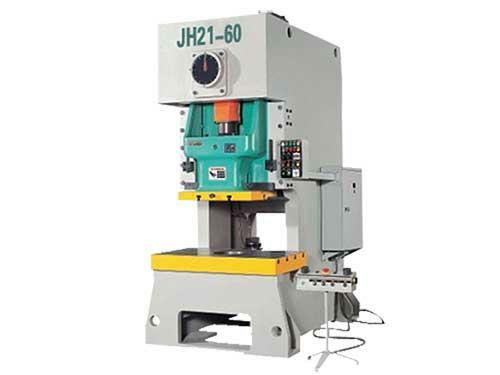 It features an outstanding rigidity, and both the work piece quality and die service life are improved. The slider uses four angles and octahedral guide ways, with the ball head treated through a soft nitriding process. The guide rail and the inlay are both made of a high hardness material in order to reduce scratches. The guide rail and inlay both feature a long guide, high precision and excellent wear resistance. The equipment comes with hydraulic overload protection with a sensitive response, and simple, reliable action. It is equipped with an electrical mold height adjustment unit, with the height of the mounting die adjustable using a motor, and the valve read out found on a digital counter. Dry friction clutch-brake with gas spring linkage, stable transmission, low noise, long life, high accuracy. The friction pairs in the moving parts of the pneumatic equipment are all treated through quenching or soft nitration to prolong and guarantee the service life. We designed the operating interface to allow the operator to have a more comfortable seated position. 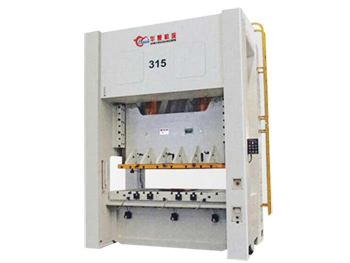 The main electrical components are Siemens products, ensuring the punching machine is stable and reliable. The PLC device is supplied from Mitsubishi and requires an operator to carry out air pressure protection and other inspection functions. It also features an automatic feeding output interface, which makes it easy to install in an equipment line, so that it, and the peripheral equipment facilitates automatic functions and more functions. The main lubricating system uses motor point by point lubricating oil. The pneumatic element uses a double solenoid valve, as well as an oil fogger, water filter, and pressure regulating valve equipped on the inside of the machine body. The element outer layer is equipped with a metal protective cover, thus making it easy to regulate the air pressure and ensure an excellent air preparation performance. 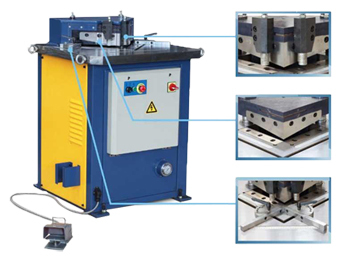 A sliding block equipped with a pneumatic balancing device balances the weight of the slider and eliminates the clearance to improve the stability and accuracy. The mechanical arm interface is set up in the electric control part of the press, thus achieving automatic production in multiple machine connections.